Cape Verdeans in Connecticut: A Community History was a three-year research project with strong public programming components. The project goal was to compile information about the community's immigration patterns and cultural continuity which could then be communicated to a variety of audiences. The project grew out of a realization that although the community maintained vibrant cultural traditions, especially in the realm of music, there was little public availability of information or recognition of an ethnic group central to Connecticut's history. Working with the Cape Verdean communities in various Connecticut cities, the Connecticut Cultural Heritage Arts Program at the Institute for Community Research recorded video and audio oral history interviews with 31 tradition bearers, musicians, and others knowledgeable about Cape Verdean history. We also gathered historical and family photographs and documents, as well as music recordings, aiming to compile materials and information giving a full picture of this group's cultural background. The project has collected thirty 90-minute tapes with transcripts, 28 recordings of traditional Cape Verdean music, and a 65 page fully labeled archive of family and historical photographs. This material, much of which has been duplicated, was originally planned to reside in two places: the Bridgeport Public Library and the archives of the Connecticut Cultural Heritage Arts Program. It is now archived at the Connecticut Historical Society in Hartford. Cape Verdeans in Connecticut: A Community Historywas a three-year research project with strong public programming components. The project goal was to compile information about the community's immigration patterns and cultural continuity which could then be communicated to a variety of audiences. The project grew out of a realization that although the community maintained vibrant cultural traditions, especially in the realm of music, there was little public availability of information or recognition of an ethnic group central to Connecticut's history. Based on the information and material collected, members of the project team planned and compiled an illustrated catalogue. This activity was funded through a CT Humanities grant. Four scholars contributed: Anthropologist Laura Pires-Hester, herself Cape Verdean, wrote the introduction to the catalogue; ethnomusicologist Susan Hurley-Glowa described the characteristics of Cape Verdean musical expressions; historian Jo Blatti provided an historical context for Cape Verdean settlement in New England; and folklorist Lynne Williamson described the project background, contributed documentary photographs, and wrote profiles of the state's major Cape Verdean communities and musicians. 2000 copies were printed and widely distributed among Cape Verdeans throughout New England. 500 copies have been sent to libraries: 200 to public libraries through the Connecticar system and 300 mailed to high school and private school libraries. Production of the catalogue has been a valuable part of the project because there is virtually no information available on Cape Verdeans in Connecticut and little on this community in general. - On June 23, 1999 project scholar Laura Pires-Hester presented a talk on the history of the Cape Verdean communities in New England at the Bridgeport Public Library. Project directors Antonia Sequiera and Lynne Williamson discussed the project's process and outcomes and described the catalogue. The organizers set up a display of art works, books, photographs, and maps relating to Cape Verde. 40 people attended, many Cape Verdeans and others interested in the topic, and took part in lively discussions. The event had a nice feel to it, very relaxed and welcoming as well as informative. - On July 17, 1999 a concert featuring five music groups and one folkloric dance group, all Cape Verdean musicians from CT, took place at the Cape Verdean Social Club in Waterbury. The catalogue was presented to the many community members who had participated in the project, and others purchased it. Nearly 300 people - mostly Cape Verdeans - attended. Pelagio Silva, President of the Club, described the project, the catalogue, and the funders to the audience in Kriolu. The project was a partnership between the Cape Verdean Womens Social Club, a 51-year old organization active in the Bridgeport area, and the Connecticut Cultural Heritage Arts Program at the Institute for Community Research in Hartford. Long-time CVWSC member and now President Antonia Sequeira was an elder community scholar with a deep knowledge of traditions and Cape Verdean history. Concerned that valuable information from the aging first generation of Cape Verdeans born in Connecticut be preserved, she collected photographs and recorded interviews with tradition bearers around the state. Antonia's goals for this project included conducting further interviews, preserving collected materials archivally and housing them publicly, and encouraging younger Cape Verdeans to assume leadership roles for the future. A key goal for CCHAP in this and its other projects is to encourage public accessibility, both for the materials gathered and placed in a public archive, as well as for fostering a clear, interesting communication about Cape Verdean culture to a wider audience which may know little about this complex ethnic group so important to Connecticut's 20th century character. Cape Verdeans in Connecticut have a long and complex history, often overlooked when this group is discussed in a New England context because of larger population numbers in Rhode Island and Massachusetts. 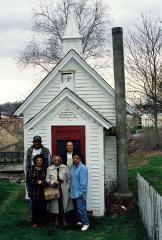 Little written material focusing on Cape Verdeans in Connecticut exists, but there is a wealth of information in the form of photographs, reel-to-reel and 78 RPM recordings, oral histories and archives relating to Cape Verdean whalemen at Mystic Seaport Museum, and historical memories residing with Cape Verdean families today. For decades members of the Cape Verdean Womens Social Club in Bridgeport were active in gathering and presenting some of these materials. This project builds on the work of community scholars, involving them in an initiative to collect and present oral histories as a way to understand and communicate the history of this little known but sizeable group (10,000 +) residing in a number of urban communities throughout Connecticut.